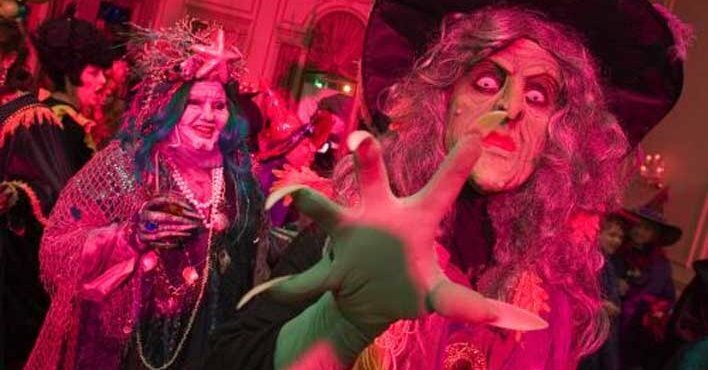 The mystics of Massachusetts witchcraft legacy and Americans obsession with all things Halloween, makes Salem the perfect setting to experience North America’s fascination with dark magic. The month is caldron filled with events that form the Festival of the Dead, a perfect tribute to America’s eccentric heritage. These include Salem’s Authentic Séance, the witches expo, a Mourning Tea party sipping brews in honour of dead relatives and a gourmet “dinner with the dead” that’s held in complete silence. For those spooked by séances or unkeen to dine with the dead will surely be enticed to The Witches Ball, held annually for anyone a fan of crazy costumes, rituals and the mystic smoke of Halloween magic. After all, It’s hard to escape the cultural nucleus of the Salem Witch trails, which date back to 1692, when women of Salem were accused and executed for witchcraft. The witchcraft craze that swept through Europe and North America caused religious puritans to persecute those they believed to be controlled by the devil. Historians view the trails, which is estimated to have taken 40,000 – 100,000 across the world, as the perfect analogy of injustice and paranoia. It brought about the populous phrase of witch-hunting, as well as the Hollywood film Hocus Pocus, where Bet Midler scared the heebie jeebies out of children. Even Arthur Millers play, the Crucible, used the trails as the backdrop to the modern day Salem of McCarthyism, an era of black listing Americans believed to be communists. Rest easy that the Salem Witch Ball won’t see you on trial for much more than your costume, with high stake prizes placed on the most elaborate. This year’s theme, The Witches Familiar, asks you to incorporate animals into your spooky persona. Drink potions and enjoy peoples wacky costume creations in the Grand Hall, where you can expect suitably strange music and live performances from Dragon Ritual Drummers and Belly Dancers. Those craving the dark arts can head upstairs for free tarot card and psychic readings, or join Salem Witches honor the dead in a magic ritual that draws the night to a close. Its generally a festival full of laughs, emerging amongst the smoke and mirrors as a lighthearted affair that’s true spirit lies in its ability to serve up some punchy cocktail potions and an unforgettable party. 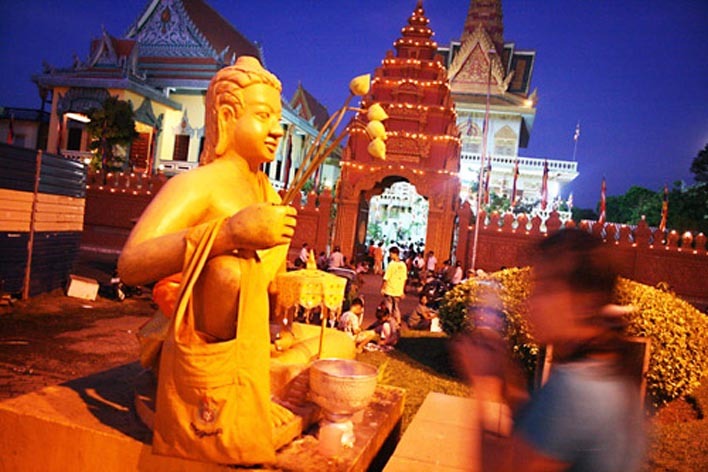 The native Khmers celebrate Pchum Ben, Cambodia’s most culturally important festival, by dedicating a national holiday to bless the spirits of the dead. The religious festival celebrates Cambodia’s belief in karma, reincarnation and the credence that, while most living creatures are reincarnated at death, some souls remain trapped within the spirit world. According to legend, the festival takes its origin from King Bath Pempiksa defilement of religious etiquette, when he ate the ceremonial rice before making offerings to the dead monks. The monks became known as the hungry ghosts, eternally tormented by the Kings actions. Despite the hungry monks pleas to several Buddha’s, it wasn’t until years later that an enlightened Buddha granted them their wish, maintaining that as long as the food was dedicated to the Monks, they would be able to eat it. And so the rice ball ceremony was born – a service led by the modern day Monks, who guide a local possession around the Buddha Sanctuary, throwing rice-balls into an empty field or around the pagoda grounds – thus feeding the hungry ghosts. Most Khmers take part, as according to tradition those who do not pay respects to their ancestors will be punished in the afterlife. It’s hard to miss families making their way to their pagoda with traditional offerings of Num Ansom, a sticky rice cake filled with green bean and pork and wrapped in banana leaf. The offering is seen to ease their ancestors suffering, whilst mediating and praying to the spirit world sees off bad karma. The most important days of the festival are the three leading up to Prachum Benda, or Ancestors Day, a time when most of Cambodia closes with metropolitan Khmers flooding back to their birthplace. Transport, such as Tuk tuks, can be tricky to find with commerce also closed for festivities so it is advised to plan head. Traditional services happen in pagodas around Phnom Penh, like the beautiful Silver Pagoda, which welcome travelers openly. Otherwise, those wanting to make the extra effort can venture towards the outskirts and surrounding countryside. Not only does it offer a more intimate affair but, away from the hustle and bustle of city life, showcases Cambodia’s stunning wilderness. Social butterflies that meet locals are encouraged to ask to join a traditional service.It is an open invitation with Cambodians known for their friendliness towards visitors, with many especially keen to share their traditions. There is a dress code with shoulders and legs to be covered; white is a wise choice as this is the colour worn for funerals. Cambodian’s have great respect for the dead and many who have had the privilege to witness Pchum Ben come away with an even greater respect for the Cambodian culture. 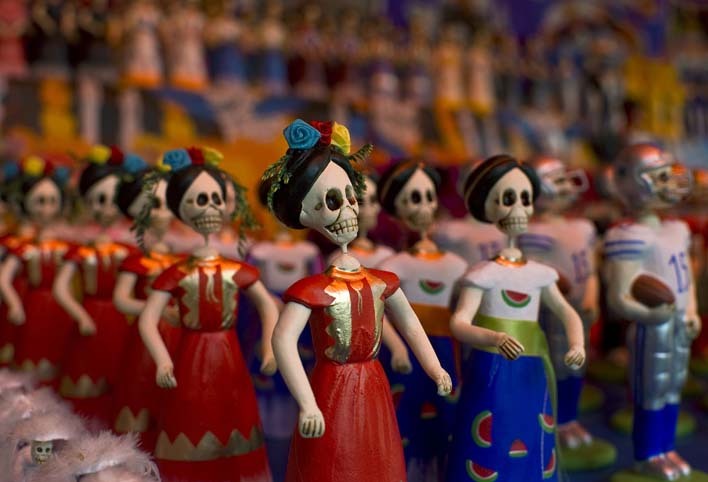 Mexico’s most famous holiday, Dia de los Muertos, has been gaining admiration from travelers for its unique cultural experience and moving tributes to the dead. It is a 360 shift from when Spanish Conquistadors arrived in the 15th Century. So appalled by the decorative skulls and pagan practices that, in their bid to covert locals to Catholicism, they moved the festival from August to the beginning of November to coincide with All Saints Day. Now one of the main events in the Mexican calendar, the flavour of the modern festival emerged in the 18th Century and is believed to have roots in Pre-Columbian rituals such as the Aztec festivals of Miccailhuitontli and Huey Miccailhuitl (the Little and Great Feasts of the Dead). In anticipation of the gloriously grisly event, you can find yourself wondering the markets and stores filled with skulls, miniature coffins and an array of skeleton themed treats. Live bands and the hum of chatter give the urban and quiet streets an inescapable energy. The smell of cooking lingers, as women traditionally spend all day preparing a customary feast, in which friends and family gather to toast the ghostly visitors. It forms the most moving tradition of Day of the Dead, which happens at nighttime with a cemetery vigil. Families will devote a day to decorating the graves of their loved ones before gathering to share food, telling enduring stories and jokes in the ambiance of flickered candlelight. The festival stems from the Indigenous belief that the dead are awakened from their eternal sleep to share celebrations with their loved ones. The souls of children are believed to return first on November 1, known as Dia de los Inocentes (Day of Little Angels) and white orchid flowers are traditionally laid at the grave. Whilst, adult spirits follow on November 2 and graves are decorated with bright orange marigolds, believed to symbolize life and hope. With a bundle of local traditions, no place celebrates the festival the same, so picking where you experience the festival is certainly worth a careful think. Mexico City and its tourist hubs will give you a buffet of options, from the urban but quaint sprawl of Mixquic, south west of the city center, where Major vigils are held at the city’s largest cemeteries, Panteón Civil de Dolores and Bosque de Chapultepec, to Zocala, the main plaza at the heart of the historic city. For those willing to go the extra mile make your way to the islands in Lake Pátzcuaro in the central state of Michoacán. It can be tricky to find accommodation but a well-executed plan will reward you with a moving experience, away from the tourist hubs and into the purest roots of the Festival. Alternatively the city of Oaxaca offers a swarm of actively, where local artist use coloured sawdust to create extraordinary altars along the main street While the city has gained popularity in recent years, through local government initiatives, it still retains a rustic charm. 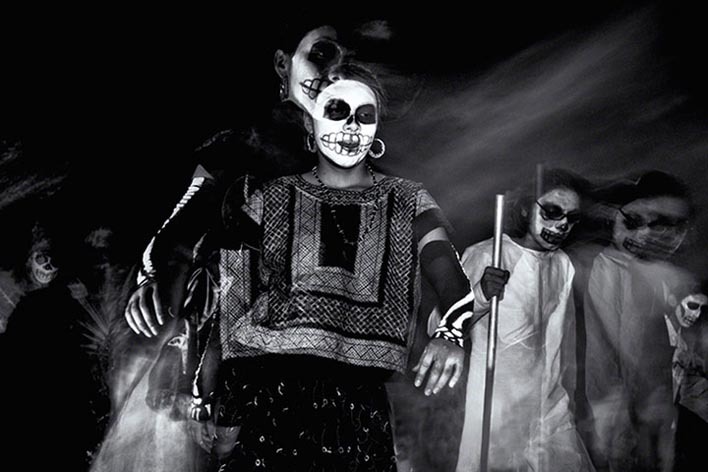 Regardless of where you end up the Festival of the Dead will offer little in disappoints, delivering a moving and truly unique cultural experience.